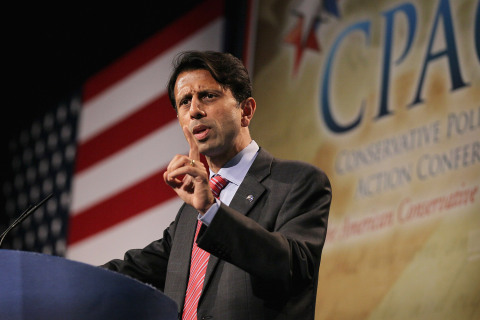 Diogenes' Middle Finger: What's the Point Bobby Jindal? What's the Point Bobby Jindal? WAPO - "Louisiana Gov. Bobby Jindal, who has been preparing a longshot bid for the Republican presidential nomination, has scheduled a major announcement about his likely 2016 candidacy for later this month. Jindal plans to declare his presidential intentions on June 24 with an event in New Orleans, an aide to the governor said late Tuesday. He is poised to enter a crowded Republican presidential field that already features nine announced candidates and likely will add a half dozen more in the coming weeks. Jindal currently is in his second term as governor of Louisiana. He previously served in Congress, and ran his state's Department of Health and Hospitals and the University of Louisiana system. Jindal, 43, a Rhodes Scholar and son of Indian immigrants, has long been hailed as a rising star in the Republican Party and one of its sharpest policy minds. Yet he has struggled to break into the top tier of 2016 presidential candidates, despite aggressively courting the GOP's socially conservative base... "
Really Bobby, what's the point? Jindal's been running for President every since his convincing win of a second term as Governor. But Jindal himself has tarnished he's star as far as Louisianians are concerned, and won't fly to high with America once his true record as Governor comes to light. While continuing to staunchly opposition to the Common Core curriculum in Louisiana schools, he has backed away from his fight with the powerful Teachers Union in the state. He has refused to deal realistically with the 1.6 billion dollar deficit the state has run up, a deficit that includes the over generous taxpayer funded Tax Credits giving to the multi-millionaire movie makers and their industry just to keep the state's reputation as HOLLYWOOD SOUTH , while turning a blind eye to the increasing corruption it's caused in the state. And in his haste to prove his conservative credentials, Jindal privatized the state charity hospital system, a system of teaching hospitals set up by Gov. Huey P. Long in the 1920's to care for widows and dependents of Civil War and WW1 veterans (which became the idea for the VA. system), and later extended to free care for all poor Louisiana citizens. Now, because of no Medicaid expansion, may citizens of the state find themselves fallen into the cracks, with part-time jobs and no income to buy federal mandated insurance. Once empty emergency rooms are now crowded. I have met our Governor Bobby, and also read his book. He is indeed a very smart man, and comes across as a committed "Compassionate Conservative". It's just unfortunate he doesn't see fit to practice it in his own state.